I love the chase—because it is so good when I catch it! When I embarked on developing Flower Farming School Online I had a list of goals for the project. At the top of that list was to make the course affordable for as many as possible. I remember my early days of starting a business- there was never enough $$$ to go around. I focused on spending my funds on the things that offered the biggest return. 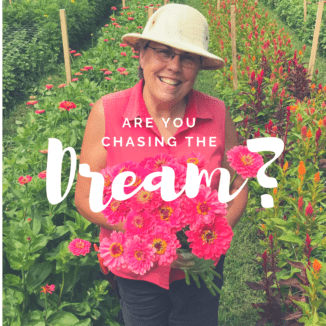 I believe Flower Farming School Online offers endless opportunities for those that want to find a way to create or realign a flower farming business. I am thrilled to share that the doors to registration for my 6-week course Flower Farming School Online will open again in the fall. If you would like to learn more and be notified when registration opens (it is only open for 10 days) sign up here and I will let you know. Lisa Mason Ziegler is a commercial cut-flower farmer in Newport News, Virginia; she lectures and writes about organic and sustainable cut-flower gardening. You can connect with Lisa on Facebook and Instagram !